pitching a nonprofit is a little different than pitching a business. the basics are still the same, but with a few tweaks here and there a nonprofit can really grab the media’s attention. in a lot of cases, it is a little easier to pitch a nonprofit. since they’re not always selling a product or service, publications are not as cautious to “advertise” for you. but that only goes so far. there are still a lot of nonprofits competing for attention and only so many placements or air time to talk about what you do. the rookie mistake is to just send a pitch that only explains what your nonprofit does. that’s good to introduce yourself, but if you want a long-term strategy for getting regular media coverage, you’re going to have to come up with new angles. media attention can help you fundraise, get more volunteers, and reach more people who can benefit from your organization. plus, it’s a great boost for your credibility and the public trust. but before we get started, i just want to let you know a little secret: you don’t have to hire an expensive PR agency on retainer to get ongoing media attention. i know a lot of nonprofits are working with tight budgets and have better places to spend their money. you can do it yourself and if you want a little help, scroll to the bottom for a link to information about private PR training workshops. so with that, let’s go over a few tricks to get started. my first step is almost always to target local media. local media loves a nice heart-warming feel-good story. then reach out to your local paper, radio station, or morning news programs. i also have found that community and regional magazines are receptive to nonprofit feel-good stories. a lot of nonprofits are based in one city, but have programs running all over the state, country, or world. wherever your nonprofit is making an impact is also a good area to pitch. one example of this is a nonprofit that i work with that sets up running clubs all over the nation. each of these cities can be a target for media attention. take a look at your stats and see where you have the most signups, donations, or people involved and let the local publications there know what is happening in their community. this can boost involvement where you already are making a difference and be used to prove your impact when you expand to new areas. leadership, funding, and partnerships, oh my! remember when i mentioned that you want to do more than just introduce your nonprofit to the media? well here’s a really easy pitch to mix things up. anytime your nonprofit changes leadership gets funding, or partners with another organization, write up a quick email and let the media know something is happening. 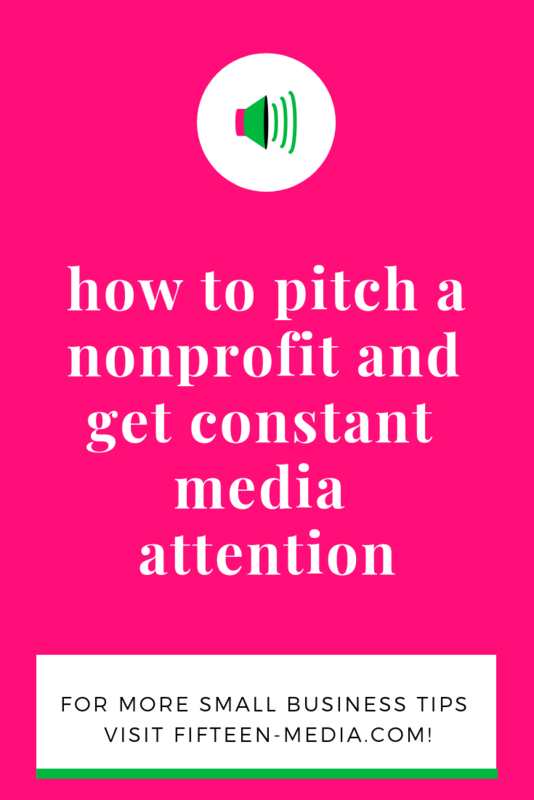 since these kinds of pitches are about the organization of the nonprofit, it is also a good chance to get in the business section. this means reaching a new type of audience and building relationships with more writers. sometimes this will get picked up and other times it won’t. in either case, it is still a good idea just that the media knows you are active and relevant. i’ve had publications call me up months later with something totally unrelated just because i had kept them periodically updated on that organization. as soon as you have the most important details finalized—date, time, location—start telling the media. you want them to put it in their personal calendar, maybe consider coming, write up a story about it, and all of that. but you also want them to put it in their public calendar, both online and in print. these are the calendars that come up when someone searches for “events this weekend in austin” or wherever and can get a lot of traction. and pro tip: if your event is going to be visual, highlight this when you contact local tv stations and tell them it might be a good opportunity to come out and shoot footage. by default, your ceo is probably an expert in the field. they should know about the problem, the solution, and everything currently going on and making a difference. now it’s time to leverage that knowledge for more media attention! position your ceo as a thought leader and pitch them as an expert who can explain the situation and give advice. i worked with the founder of the fireborn institute and my goal was to position her as an education and parenting expert—because she is! she was interviewed by publications on topics ranging from how to travel with your kids, to how to talk to your children about current events, and how parents can help their kids with homework. it was great and she helped a lot of people in the process! come up with a list of topics your ceo (or whoever is the public face of your company) is comfortable talking about and pitch the media. i usually work these topics into a few bullet points that already sound like article headlines. and again, if you need help with any of this, i can come train you and your team, brainstorm ideas, and get you started on a killer PR strategy you can do all on your own.